"The room was nice sized, clean and quiet." Have a question for The Siam Heritage Hotel? 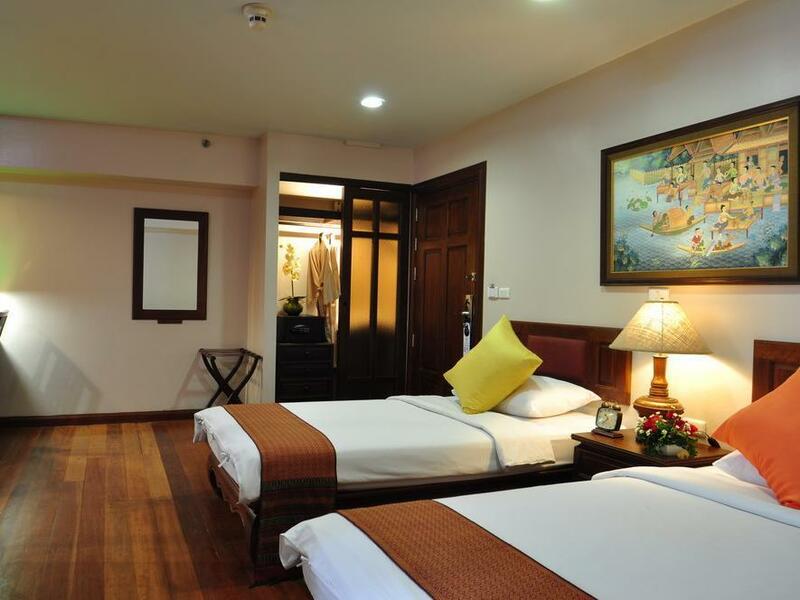 "Lovely, quaint hotel that , centrally located Easy walk to MRT so that we were able to visit the Chatuchak Weekend Market and easily get to Hua lamphong railway..."
"The room looks quaint but comfy, again had a lot of charm, as well as the rooftop pool was amazing!" 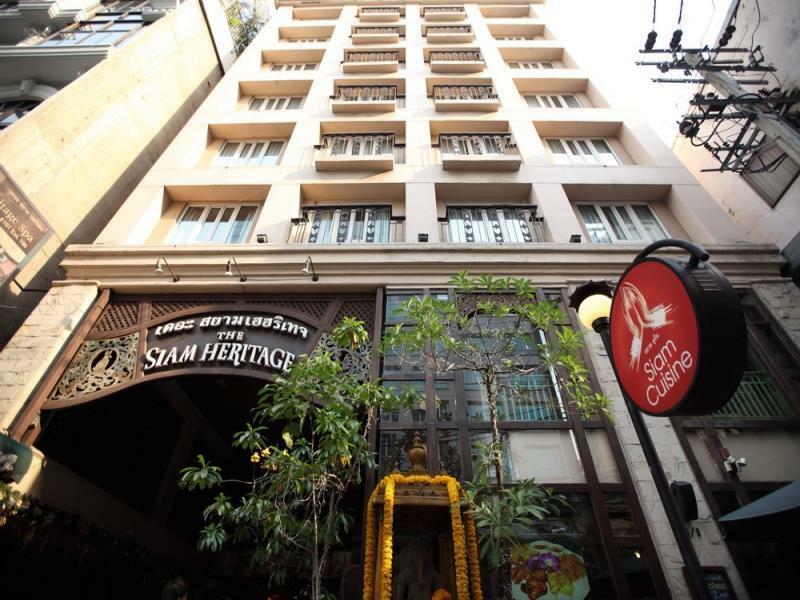 "Hotel was in a good location, close to paying night bazaar a..."
The Siam Heritage Hotel is one of the finest and most traditional Thai-style accommodations in downtown Bangkok. Offering 73 elegant rooms and suites, each unit blends modern technologies with intricate furniture from the Lanna and Middle Rattanakosin era. Guests can experience an old-world style of living while still being provided with the comforts and conveniences today’s travelers’ need. The beautifully built wooden bed is handcrafted in traditional Tung style and features a quality mattress as well as linens and pillows to unsure a great night's sleep. Around the hotel, guests will discover an array of facilities such as a rooftop swimming pool with heated Jacuzzi, a comprehensive fitness center, an Internet corner, a pool bar, a spa, and two great in house restaurants for dining in. Location-wise, the hotel is within close proximity to many corporate and diplomatic offices, banks, shopping malls, and entertainment venues. 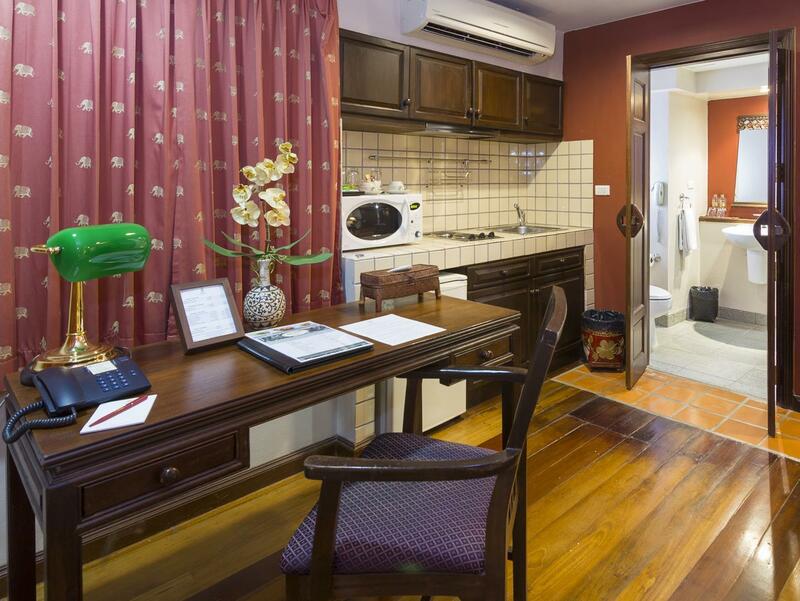 The property is also accessible to Bangkok's convenient subway and skytrain systems. If you’re looking for a special and unique experience, look no further than The Siam Heritage Hotel. "My favorite hotel in BANGKOK!" Airport transfer is available at an additional charge. In order to reserve the transfer, please inform the property of your arrival details at least 2 days prior to arrival. The location is perfect for Silom and Patpong areas. Nice cozy Siamese hotel with lots of art and artifacts. Nice friendly staff. On the top floor there is a swimming pool and sun deck. Breakfast is sufficient with Western and Thai dishes. Recommended. Great location. Well maintained property. Traditional style. Very cozy roof top pool and bar. The gym is the only part of the hotel that is sub par. Several neighborhood gyms near by if you need it. The staff is very attentive and professional. The breakfast is good. I’ve stayed here 4 times and had great service. Very reliable staff for arranging taxi to your next destination. So clean , roof top pool is amazing and great location to everything !!! First time stay in this hotel. Pics were looking good on Internet but when we checked in we ended up in a room viewing a wall in a small alley, causing the room to be dark. Run down furniture completed the disappointing impression. we decided to upgrade to a suit. The price for upgrade per night is 1K bath and felt a bit overpriced. air con in the room was hot and cold. sometime the shower water was also switching from hot to cold. Cleanliness was good and WiFi have to connect all the time when your mobile phone are off. Breakfast was good but little selection. Bed are a little too hard and pillow are too soft to support the head when sleep. Location was good and easy to access. Great location in Silom near lots of restaurants,bars,market and shopping.Check in was quick easy and efficient.Had room 708 lovely room in old teak wooden floor boards and great window view of an amazing building.Had a microwave, kettle,cutlery and bowls and plates.Nice bathroom with big shower and of course the usual amenities.Lovely small pool and spa tub on the 9th floor, limited sundeck chairs so best to get there early to grab a spot.We ate in the hotel restaurant downstairs.The food was delicious and reasonably priced.Great breakfast, loved the asian food and nice selection of bread.We would have no hesitation staying here again. Thank you Siam. Lovely, quaint hotel that , centrally located Easy walk to MRT so that we were able to visit the Chatuchak Weekend Market and easily get to Hua lamphong railway station. My son loved the rooftop pool and the pool bartenders were very nice. Personally, I did not like the Pad Thai though from restaurant, but my son liked his spaghetti. Room was comfortable and clean. Good WIFI and decent AC. Would recommend. I have stayed at the Siam Heritage twice in the last month. It is in a location that is close to everything. The staff are great and are always very helpful and friendly. The buffet breakfast is excellent with eggs cooked to order. The highlight of the hotel is the rooftop pool and garden. It is truly an oasis in the middle of the chaos of Bangkok! The pool is not large but a good place to relax. The Siam Heritage is not a new modern hotel but it is well maintained. The teak flooring, woodwork and furniture has the flavor of old Siam. This is my new favorite hotel in Silom. Definitely would recommend this hotel if you are not driving. Location makes for easy walking to market or hospital. Lots of restaurants and room was nicely laid out. The only disadvantage is there is no parking. We had a car so it was a bit of a pain parking at the temple and then walking through crowds with suitcases. This was my first time at the Siam Heritage but it will not be my last. The hotel is a bit old but well maintained. The teak floors and woodwork and furnishings speak of the beauty of Thailand. Certainly not cold and modern like so many new hotels! The staff are exceptional and personify the true Thai spirit of helping with smiles. The breakfast is great with eggs cooked to order and coffee that is fit to drink. Most of the time the wifi worked well but sometimes disconnected but it was not a problem. It is only a short walk to either the BTS or MRT. I was booked at another hotel in 2 weeks but cancelled and will be staying at the Siam Heritage. We are traveling Asia with our 1,5 year old son and pick this hotel for our first nights in Bangkok. The hotel is very centrally located, right downtown, and has a very authentic Thai feel. The rooms are very spacious (easy to set up a baby cot in) and the roof top pool is awesome. The swimming pool restaurant also serves great food and the prices aren’t that high. We will defiantly be back for another visit. 1. Excellent room with in classic Thai style with comfortable bed. 2. Excellent staff including the General Manager who is very approachable and caring. 3. Breakfast - unbeatable: ambiance, service and my requests for boiled eggs are always granted - thanks to Moddam. Large, clean room with walk-in shower, high floor, quiet. Well located in the city. Easy access to all the sights of Bankok. Breakfast was not extensive, but well-prepared. The rooftop garden and two wading pools were a welcome respite in the evening. Staff is very welcoming and attentive. One of the best hotel values in Bangkok. Lovely clean anc comfortable room, fine breakfast,beautiful pool and surroundings. Mostly, knowing the staff were always present,friendly and so helpful especially as a solo traveller. I would definitely stay here again. I was pretty underwhelmed by this hotel. It’s in a decent location with both metro (5 minute) and skytrain (10 minute) walk. The room was comfortable and clean although dated and dark (especially in the bathroom). Bed was fine, AC worked, WiFi and English channels. Main problem was the weird entrance and lobby being up the elevator, the complete lack of staff except for the front desk who wasn’t helpful at all, only the security(?) downstairs was friendly. The receptionist basically didn’t say anything to us and just handed us our keys...we didn’t even realize there was a pool until after we checked out. When we asked if there was a shuttle to the metro with our bags, his response was “it’s close enough for you to walk” which was a bit rude considering our heavy bags. Still not sure if they provide a shuttle and he thought we didn’t need it, or if there actually isn’t one. No breakfast included in the cost which I think at the price it should have been included. Overall it’s fine for a night and for the location, but has none of the warm and friendly Thai hospitality I have encountered at other hotels in the same and cheaper price ranges. Hotel was in a good location, close to paying night bazaar and lumphini park. Heaps of good places to eat close by. Nice little pool on the top floor. Only bad things I could say is the bed was very hard and the beers were a little expensive. 130 baht for a small Singha was a bit much I thought. Overall though, is a nice little hotel.